A very exciting thing happened- I managed to navigate the narrow, slippery tunnels under Ravelry HQ to finally release my Laura and the Wolf pattern! Yippee! It now lives here. I’ve learned so much in the process of publishing this first pattern! It is a slow process but, in the end, I am really pleased with it… if you are interested, leave me a comment- everyone who does so between now and Sunday night will receive a free copy of the pattern on Monday morning! I’d love to be inspired by other versions of the story that I love so much. This entry was posted in community, knitting and yarn and tagged colourwork tam pattern, laura and the wolf on May 22, 2012 by admin. I think its probably way too advanced for me to try, but I like looking at it. I love the heptagon shaping – there is something very satisfying about odd numbers. Well done with publishing the pattern, it’s always a far longer process than you think it will be. Congratulations Jules! It’s a beautiful tam, and I hope it does fantastically well. It’s beautiful Jules! You should be more confident, you’re super talented!! It is so beautiful! 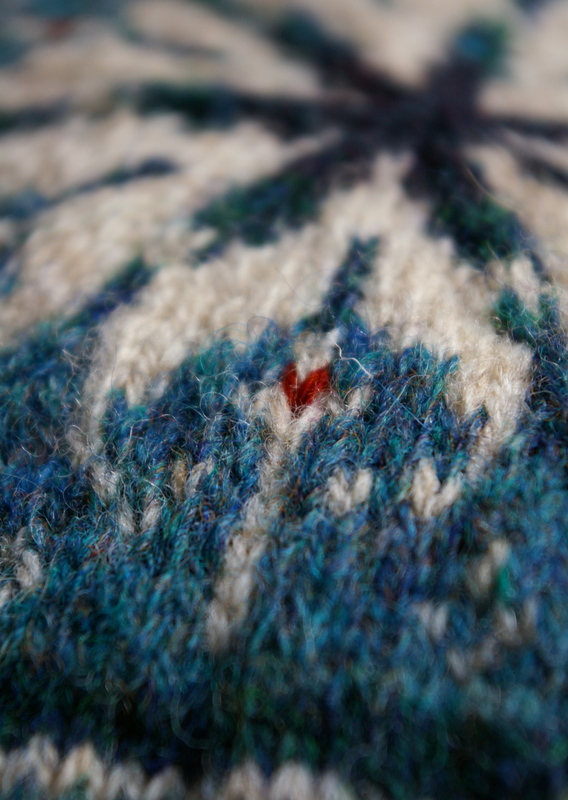 I’m trying to pluck up the courage to try some colourwork – when I do this will definitely be on my list. Well I understand under-confidence myself, but you have no need for it…this pattern is stunning work! Congratulations. Oh, the best part of all is the inspiration! I love pioneer stories. Maybe it’s because I live where so many settled….They were a hardy lot! I have loved this since you first showed it to us, as I think I said before. I’m so glad you published! It’s so lovely to be able to buy a beautiful pattern like this made by someone so talented that you actually know! Congratulations for getting it written up and published. It is beautiful. I wish I had time to learn to do colourwork. What a wonderful design. Colourwork is so much fun, but I can just imagine how much work goes in to writing a pattern like that. Well done. Wishing you much success! Hey! I found your blog through your pattern on Ravelry. Lovely hat, and that’s your first published pattern? Congrats! Love this hat! The colors are beautiful together, and I love the little red heart shapes. Congratulations on your first pattern. You’re amazing. You know this, right?